Saying it had completed an investigation into alleged voter irregularities, Iran’s election authority on Monday stood by its findings that gave hardline President Mahmoud Ahmadinejad an overwhelming victory and sparked more than two weeks of chaos in the streets. There was “no tangible irregularity,” Guardian Council spokesman Abbas Ali Kadkhodaei told government-run Press TV after reporting that a recount of some 10 percent of the votes found no significant differences. “After this, the file will be closed and from today on in the presidential election, the file has been closed.” In an hour-long interview addressing a series of complaints, Kadkhodaei noted that some 40,000 representatives of the various candidates observed the ballot boxes to ensure that rules were followed. Given there were 46,000 ballot boxes, that meant 6,000 were unattended. Even so, allegations of wrongdoing were investigated thoroughly, he said. Kadkhodaei acknowledged that some ballot boxes may have contained more ballots than the number of voters in a given area, but said that did not necessarily mean there were irregularities. Voters were not restricted to polling places in their home town, so the extra votes could have come from travelers, he said. Charges of vote buying also were investigated, and “we didn’t find that to be true,” he said. Kadkhodaei also dismissed allegations that some voting sites had an insufficient number of ballots, saying those charges were “not true at all.” Despite the record turnout, he said, ballots were available at all the polling stations except for “one or two,” where voters had to wait between 20 to 40 minutes for new ones to arrive. He added that elections officials had taken pains to accommodate extra voters by opening at 8 a.m. instead of the usual 9 a.m. and by extending until 10 p.m. or later the time when people were allowed to cast their ballots. “We did whatever we could, beyond our legal duties,” he said. Kadkhodaei said the recount of 10 percent of randomly selected ballot boxes was carried out in front of cameras to allay any suspicions. In addition, he said, the candidates and their representatives were invited to observe the process of recounting. Interior Minister Sadeq Mahsouli was informed of the Guardian Council’s conclusion Monday in a letter from council chief Ayatollah Ahmad Jannati, according to Press TV. The Guardian Council last week extended the deadline for filing complaints after two candidates, Mir Hossein Moussavi and Mehdi Karrubi — questioned the legitimacy of the June 12 vote count. Moussavi had rejected the offer of a partial recount and refused to appoint a representative to the committee, according to Press TV. CNN could not immediately reach Moussavi for comment. The third presidential candidate, Mohsen Rezaie, maintained that his representatives would not be present for the partial recount, unless there was equal representation from Moussavi and Karrubi’s camps, according to Iranian media reports. Rezaie at first rejected the election results and filed a complaint, but later withdrew that complaint. 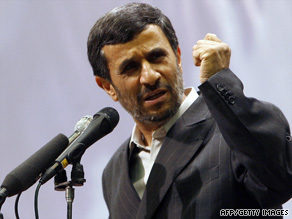 The Guardian Council initially declared Ahmadinejad the winner of the June 12 elections, sparking more than two weeks of protests and, at times, clashes between demonstrators and government troops and members of a paramilitary force. At least 17 protesters were killed in the chaos, according to official statistics, though the actual number may be higher. Iran’s Supreme Leader Ayatollah Ali Khamenei called Sunday for an end to street demonstrations after about 5,000 people shuffled in silence down Tehran’s Shariati Street to the Ghoba mosque. “I advise both sides not to provoke the emotions of the youth, not to stage people against one another,” he said in a speech on Press TV. “This integrated nation must not be split and a group must not be incited against one another.” Though authorities allowed Sunday’s demonstration — intended for “the pious” — they intensified their crackdown over the weekend, reportedly seizing wounded protesters from their hospital beds and arresting nine local British Embassy staff in Tehran. An Iranian Foreign Ministry spokesman said Monday that five of the staffers had been released, while four others remained in custody as an investigation continued. British Foreign Secretary David Miliband on Sunday protested the arrests, calling them “harassment and intimidation of a kind which is quite unacceptable.” Iran has restricted international news agencies, including CNN, from reporting inside the Islamic republic. Its intelligence minister, Gholam-Hossein Mohseni Ejei, blamed Western powers for stirring up protests, saying Sunday that the British Embassy in Tehran “played a heavy role in the recent disturbances,” but describing the effort as one led by the United States. “The fact that Iran is stable, calm and secure, they’re upset with this,” Ejei told Press TV. “The idea that the British Embassy is somehow behind the demonstrations and protests that have been taking place in Tehran in recent weeks is wholly without foundation,” Miliband said. Last week, Tehran expelled two British diplomats. London responded by booting two Iranians, prompting Iran to recall its ambassador to Britain — a serious gesture in diplomatic circles — and threatening to reconsider Anglo-Iranian diplomatic ties.